My name is John Kavula, and I am the new Elks Scholar Fellow. In May, I graduated from Marquette University in Milwaukee with a degree in Applied Mathematical Economics and moved to Chicago. Although it has only been one week, the Elks National Foundation has already warmly welcomed me as a part of their amazing team and I know I have found a new home. Starting in the first week of June, I could not have arrived at a busier and more exciting time. With less than a month until 150 for 150, everyone in the office is working very hard, so I hit the ground running. Luckily for me, the outgoing fellow, Jenna Johnson, left me everything I could possibly need, including a detailed manual and outlines to prep for the Elks National Convention. Even with everything going on, everyone has taken time out of their day to introduce themselves and to get to know me a little bit, and for that, I am very grateful. As part of my orientation, I got a chance to meet with each department in the ENF to learn about what each does and how they all work together. I really enjoyed seeing the different aspects of the ENF because it will not only help me do my job better, but I can also better understand the breadth of everything the Foundation does. On Thursday, I went to help set up for the Chicago Standdown with a few of my coworkers. At the bi-annual Standdown, over 800 veterans come and receive various goods and services, such as boots, toiletries, haircuts and vision checks-- all free of charge. On-site at the General Jones Armory, we did everything from unpack hundreds of pairs of boots to set up chairs and tables for the many different vendors. I enjoyed the day not only because I got to be part of such a fantastic event that helps so many people, but I also got to spend some time outside of the office with my new coworkers. On Friday, I went back for the actual event, and, again, had a great time. We spent most of the morning in the donated clothes area, where we helped the veterans pick out clothes. I really enjoyed Friday because it was more direct service since I was able to converse with some of the veterans and hear their stories. As my first week at the ENF came, I am grateful the team has been so welcoming. Although my work will not always be easy, especially at first, I know my coworkers will be here to help with whatever I need and support me. I am so thrilled to begin my career with the ENF, and I’m excited to see what the next two years have in store for me. The Elks National Foundation offers three Elks Scholar Service Trips. 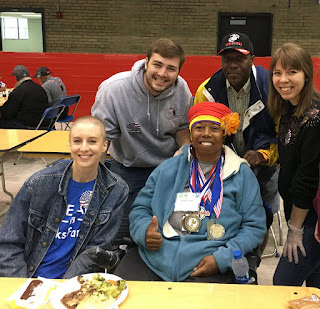 These trips provide scholars the opportunity to learn about societal issues, serve those in need in the name of the Elks, and connect with their Elks family from across the country. For more information about the trips, click here.